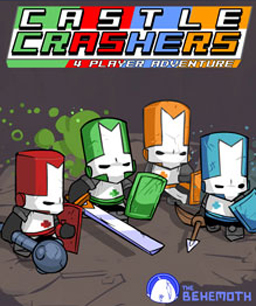 I cannot tell you how much I love Castle Crashers, and have indeed loved it since I first played it at my friends house back in 2009 on her massive flat screen & Xbox set-up, laughing my way through a game with the sort of humour that I hold dear. It’s a straightforward beat ’em up console game developed by The Behemoth, a company containing the creator of the wonderfully time consuming Newgrounds flash-based website, and because Castle Crashers has been worked on by the awesome tagteam of Tom Fulp and Dan Paladin, it has similar playing and visual elements to other related gaming classics such as ‘Dad n’ Me’ and ‘Alien Hominid,’ with a classic 2D style and instantly recognisable art which has become a signature for Dan Paladin. The Hublet and I debated long and hard over what console to get as our first couple purchase, ultimately decided on a PS3 due to the amount of friends we shared who were already on the network. We scrolled through the demos available in order to do a little ‘try-before-you-buy’ and I was overjoyed to find that Castle Crashers had come to Playstation. The game is refreshingly free of long winded dialogue, with simple animations and a focus on brawling hack’n’slash gaming. The game opens with a mysterious villain (you can tell by the outfit and tense music) stealing a large crystal from a King, along with an assortment of princesses, all of which you are obviously tasked with retrieving. 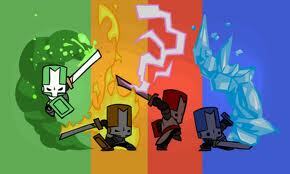 At the start of the game you have only 4 knights to select from, the colour relating to their magic power (Red = lightning, Blue = ice, Green = poison and Orange = fire) with more knights being unlocked as you progress through the game. As you level up your knight, you’ll earn skill points to add to your Strength, Defense, Magic, Speed and also to optionally increase the abilities of the assortment of cute critters found and unlocked along the way who act as your non-player character companions/animal orbs and orbit you while carrying out functions specific to their type, either fulfilling attack, strengthening, healing or collection functions. 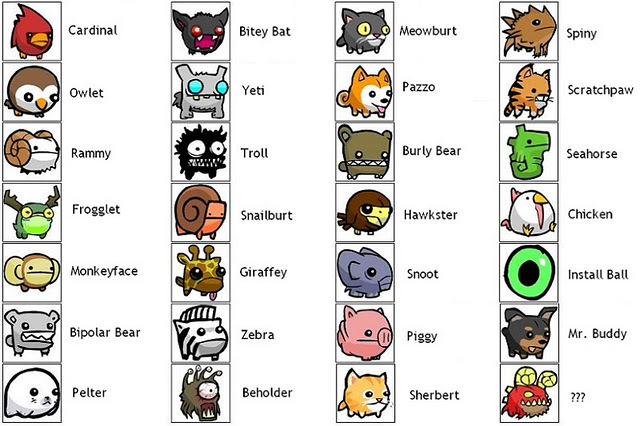 As you replay the game with various animal orbs, they in turn will unlock further animal orbs, making this game great fun to play again and again. To counteract the revolting cute things found absolutely everywhere, the game contains a lot of gore and toilet-humour to balance things out. Along the way you will be able to replace your current weapon with new ones that are either dropped by defeated enemies, brought at an in-game shop, bestowed upon you by others or found en route. Once you complete the game on normal difficulty you unlock the Insane Store, which opens up new characters and options for you to play around with. Although it’s an enjoyable game played by yourself, it can make some of the Bosses overly tough and makes the game more frustrating and less fun than it would be if you got some friends involved, either sitting next to you or via the Xbox/Playstation networks. One of the major differences between the Xbox and PS3 version is that the ‘All You Can Quaff’ mode has been replaced with a Volleyball mode, and the Team Arena option has been updated to allow Two-on-One or All vs One battles. I actually prefer the Campaign mode to the other options as it’s a beautifully designed, funny game with a lot of hidden weapons and animal orbs, numerous characters for you to replay as and a healthy amount of challenge. This is the sort of game that reminds us how fun a simple, straightforward premise can be, and the unique art, quirky humour and overall concepts that are a signature style of Fulp and Paladin result in a game that will eat up a lot of your spare time and is enjoyable to play over and over again.